It's Wednesday again and time for another What if? Wednesday challenge at The House That Stamps Built and today is a sketch challenge! Pretty straight forward sketch, don't ya think? You can have some fun flipping this sketch in various ways or use it just like it is. Either way, I hope you'll give it a try and enter your project over at The House. 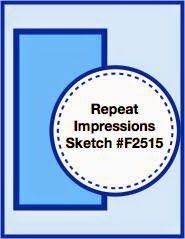 You will then be in the running for a $25.00 gift certificate for some awesome Repeat Impression stamps. Get the details at The House. LOL! Have you ever had a day when you look in the mirror and this sort of image is looking back at you and this is exactly what you were thinking? I decided to have some fun with this sketch and use a stencil and stencil paste to create the side panel. The stencil paste was white and I added some Perfect Pearls to get the color I wanted before stenciling it onto the card base. The image is RI #5306-J "Chimp". After stamping the image I colored it with Copic Markers, then added some Wink of Stella clear glitter pen to the entire face. Using a classic round Spellbinder die, I cut it out and then pressed it into VersaMark ink, added some clear ep and heat set it for a high gloss appearance. I framed it with the next sized classic round die in the set. The sentiment is RI #7011-F "This Day". There's a 10% off Repeat Impressions stamps code on my side bar if you'd like to pick up some of these fabulous Repeat Impressions stamps. I promise you will love them. Just use the code rr10cw when checking out. Thanks for stopping by. For more inspiration using this WIW sketch, have a gander at what the other Rock Stars have done with it. I love monkey's - always have. This sentiment is just to darn funny. 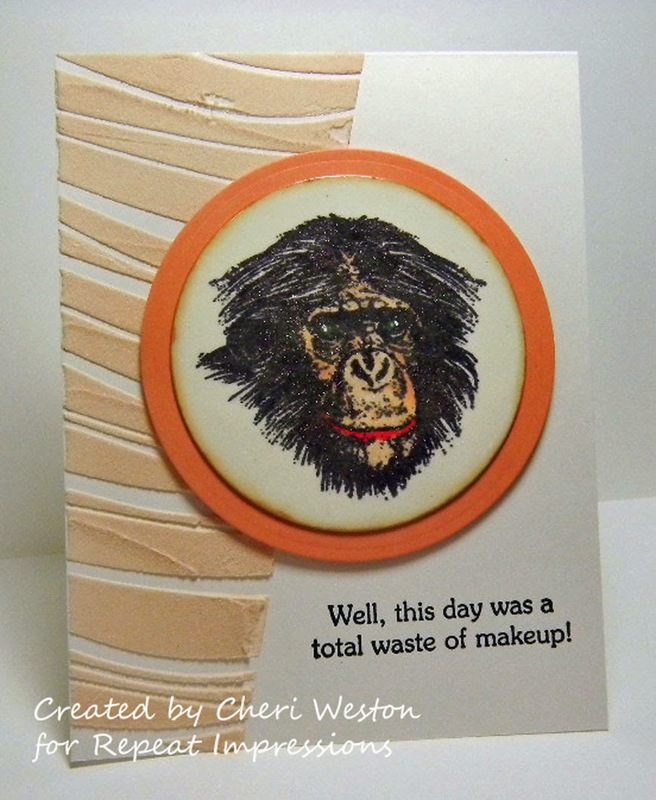 Great texture, but the lipstick is what really makes this card. Great work Cheri!